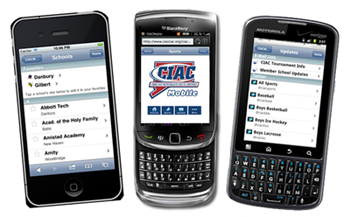 Due to the continuing increase in people accessing website sports information from mobile phones, the CIAC has created a mobile version of CIACSports.com. The mobile version expands the content available of the previously available SchoolZapp Connecticut iPhone app. CIACMobile will work in the browser of any iPhone, iPod or Android device, as well as Blackberrys that use the latest version of the Blackberry OS. It will also work to varying extents in the web browsers of other phones. To access the site point the web browser on your phone to http://ciacmobile.com/. If you plan on using the site regularly when you first visit you may wish to save the site as a favorite on your home screen. Listing of schools with the ability to save schools as “Favorites”.